Copyright © 2013 Alexander Zuevsky. This is an open access article distributed under the Creative Commons Attribution License, which permits unrestricted use, distribution, and reproduction in any medium, provided the original work is properly cited. 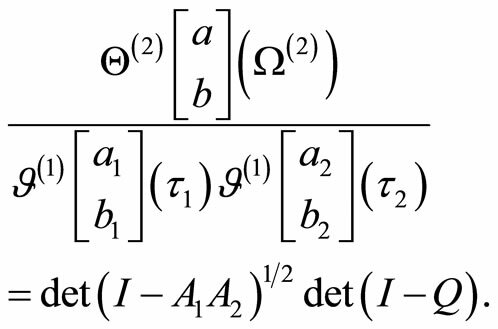 We review our recent results on computation of the higher genus characters for vertex operator superalgebras modules. 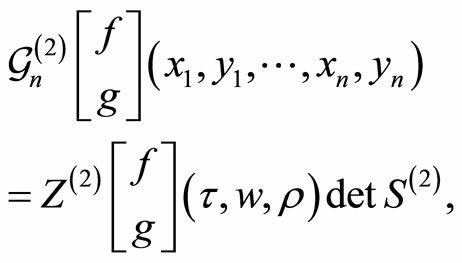 The vertex operator formal parameters are associated to local parameters on Riemann surfaces formed in one of two schemes of (selfor tori- ) sewing of lower genus Riemann surfaces. 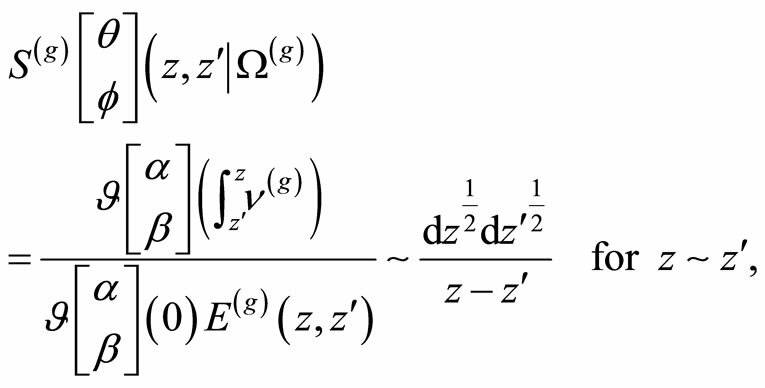 For the free fermion vertex operator superalgebra we present a closed formula for the genus two continuous orbifold partition functions (in either sewings) in terms of an infinite dimensional determinant with entries arising from the original torus Szegö kernel. This partition function is holomorphic in the sewing parameters on a given suitable domain and possesses natural modular properties. Several higher genus generalizations of classical (including Fay’s and Jacobi triple product) identities show up in a natural way in the vertex operator algebra approach. In this paper (based on several conference talks of the author) we review our recent results [1-5] on construction and computation of correlation functions of vertex operator superalgebras with a formal parameter associated to local coordinates on a self-sewn Riemann surface of genus which forms a genus surface. In particular, we review result presented in the papers [1-5] accomplished in collaboration with M. P. Tuite (National University of Ireland, Galway, Ireland). Definition 1 A -module for a VOSA is a pair , is a -graded vector space , , for all and . where denotes the eigenspace of with eigenvalue . with , , sufficiently large. We define the notion of creative intertwining operators in . Suppose we have a VOA with a -module . for , , and integers . In  we consider an extension of by its irreducible modules generated by a -valued continuous parameter automorphism . The operators with some extra cocycle structure satisfy a natural extension from rational to complex parameters of the notion of a Generalized VOA as described by Dong and Lepowsky [7,12]. We then prove in . where and with for all . where , for , . In  we describe procedures of sewing Riemann surfaces . Consider a self-sewing of the oriented torus , , . having the exceptional transformation law. 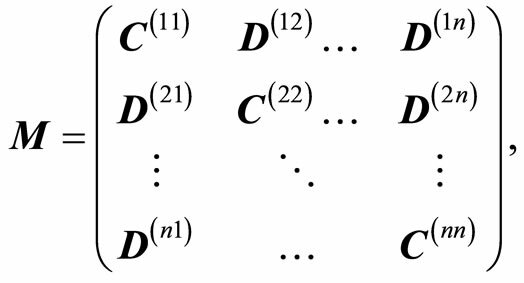 converges absolutely and uniformly on compact subsets of the domain . is periodic in with periods and with multipliers and respectively. be a holomorphic 1-form, and let denote the form of weight on the double cover of . where denotes the diagonal elements of a matrix . Yamada (1980) described how to compute the period matrix and other structures on a genus Riemann surface in terms of lower genus data. as a formal power series in . b) is non-vanishing and holomorphic on . 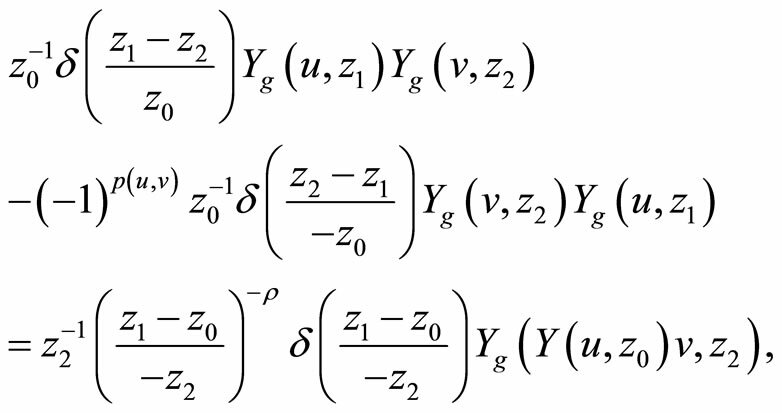 Furthermore we may obtain an explicit formula for the genus two period matrix on . Here refers to the -entry of a matrix. 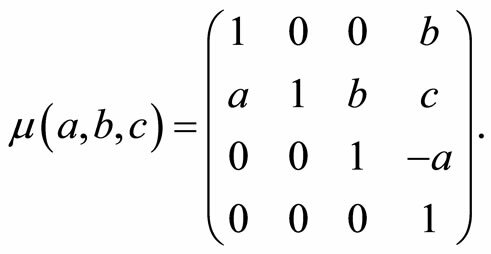 a) The infinite matrix is convergent for b) is non-vanishing and holomorphic on . It is convenient to define by . with similar expression for for . a) is convergent for b) is non-vanishing and holomorphic in on . 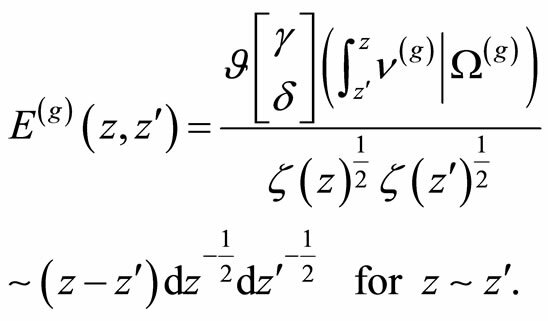 Each orbifold 1-point function can found from a generalized Zhu reduction formulas as a determinant. 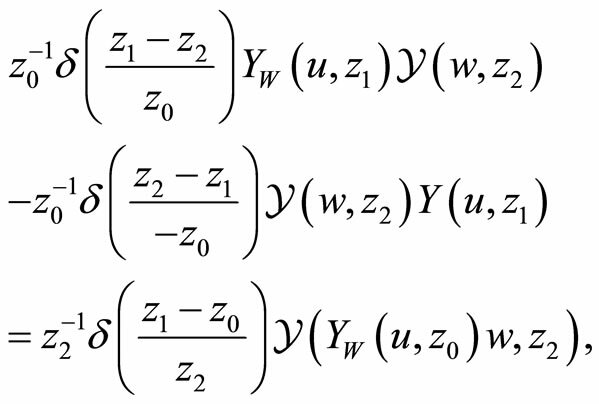 Every orbifold n-point function can be computed using generalized Zhu reduction formulas in terms of a determinant with entries arising from the basic 2-point function for . for with and . is the sign of the permutation associated with the reordering of to the alternating ordering. 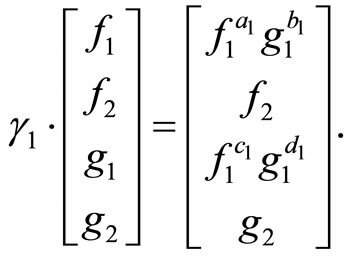 Furthermore, the -point function is an analytic function in and converges absolutely and uniformly on compact subsets of the domain . As in ordinary (non-intertwined) case [2,19,20,24-29] we construct in  the partition and -point functions [30-39] for vertex operator algebra modules. associated to the torus intertwined -point function. for real valued , , , . with alternatively inserted states and states distributed on the resulting genus two Riemann surface at points . We then prove in . with elements given by parts of the Szegö kernel. 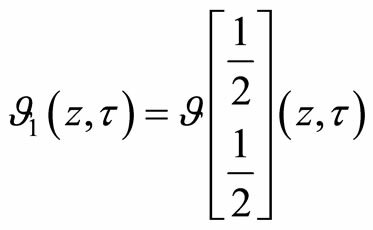 The inner sum is taken over any basis and is dual to wrt to the Li-Zamolodchikov metric. We can compute using a combinatorial-graphical technique based on the explicit Fock basis and recalling the infinite matrices . d) has an infinite product formula. c) has natural modular properties under the action of . denotes the pair , (respectively , ). The sum is taken over any -basis. where is the genus one intertwined two point function. 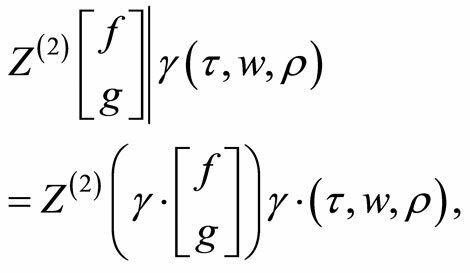 Remark 1 We can generalize the genus two -point function by introducing and computing the differential form associated to the torus -point function containing several intertwining operators in the supertrace as well as corresponding genus two -point functions. for , , where is the Jacobian of the curve. where is the intertwined module torus basic two-point function, and is some function. where is the rank one fermion intertwined partition function on the original torus. and is the genus two partition function. for the generator . We then find . for all genus two -point functions . 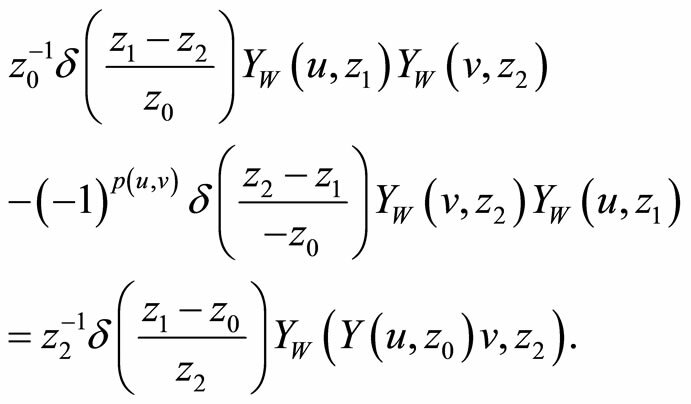 is modular invariant with respect to with a multiplier. The author would like to express his deep gratitude to the organizers of the Conference “Algebra, Combinatorics, Dynamics and Applications”, Belfast, UK, August 27-30, 2012. 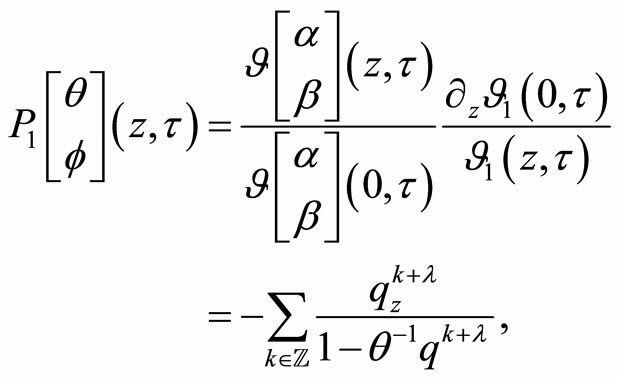 M. P. Tuite and A. Zuevsky, “The Szegö Kernel on a Sewn Riemann Surface,” Communications in Mathematical Physics, Vol. 306, No. 3, 2011, pp. 617-645. M. P. Tuite and A. Zuevsky, “Genus Two Partition and Correlation Functions for Fermionic Vertex Operator Superalgebras II,” to Appear, 2013. M. P. Tuite and A. Zuevsky, “The Bosonic Vertex Operator Algebra on a Genus g Riemann Surface,” RIMS Kokyuroko, Vol. 1756, No. 9, 2011, pp. 81-93. I. Frenkel, Y. Huang and J. Lepowsky, “On Axiomatic Approaches to Vertex Operator Algebras and Modules,” American Mathematical Society, Providence, Rhode Island, 1993. I. Frenkel, J. Lepowsky and A. Meurman, “Vertex Operator Algebras and the Monster,” Academic Press, New York, 1988. V. Kac, “Vertex Operator Algebras for Beginners,” University Lecture Series, AMS, Providence, 1998. H. M. Farkas and I. Kra, “Theta Constants, Riemann Surfaces and the Modular Group,” Graduate Studies in Mathematics, AMS, Providence, 2001. R. C. Gunning, “Lectures on Riemann Surfaces,” Princeton University Press, Princeton, 1966. D. Mumford, “Tata Lectures on Theta I and II,’’ Birkhäuser, Boston, 1983. J. D. Fay, “Theta Functions on Riemann Surfaces,” Lecture Notes in Mathematics, Springer-Verlag, Berlin, 1973. J. D. Fay, “Kernel Functions, Analytic Torsion and Moduli Spaces,” American Mathematical Society, Providence, Rhode Island, 1992. Y. Huang, “Two-Dimensional Conformal Geometry and Vertex Operator Algebras,” Birkhäuser, Boston, 1997. 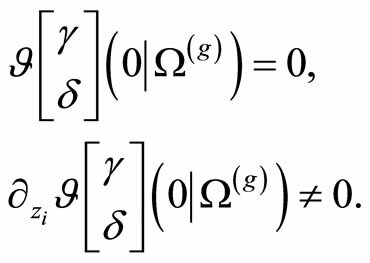 A. Matsuo and K. Nagatomo, “Axioms for a Vertex Algebra and the Locality of Quantum Fields,” Mathematical Society of Japan, Hongo, Bunkyo-ku, Tokio, 1999. G. Mason and M. P. Tuite, “Free Bosonic Vertex Operator Algebras on Genus Two Riemann Surfaces II,” arXiv:1111.2264v1. M. R. Gaberdiel, Ch. A. Keller and R. Volpato, “Genus Two Partition Functions of Chiral Conformal Field Theories,” arXiv:1002.3371, 2010. 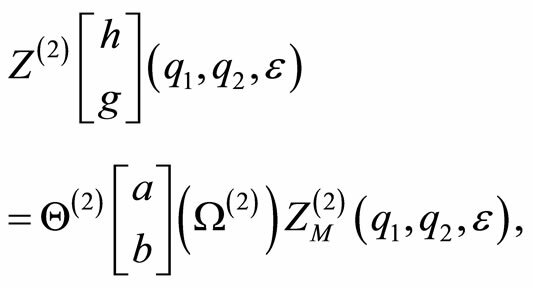 M. R. Gaberdiel and R. Volpato, ‘‘Higher Genus Partition Functions of Meromorphic Conformal Field Theories,” Journal of High Energy Physics, Vol. 9, No. 6, 2009, p. 48. N. Kawamoto, Y. Namikawa, A. Tsuchiya and Y. Yamada, “Geometric Realization of Conformal Field Theory on Riemann Surfaces,” Communications in Mathematical Physics, Vol. 116, No. 2, 1988, pp. 247-308. A. Tsuchiya, K. Ueno and Y. Yamada, “Conformal Field Theory on Universal Family of Stable Curves with Gauge Symmetries,” Academic Press, Boston, 1989. K. Ueno, “Introduction to Conformal Field Theory with Gauge Symmetries,” Geometry and Physics, Lecture Notes in Pure and Applied Mathematics, Dekker, New York, 1997, pp. 603-745. G. Mason and M. P. Tuite, “Vertex Operators and Modular Forms,” In: K. Kirsten and F. Williams, Eds., A Window into Zeta and Modular Physics, Cambridge University Press, Cambridge, 2010, pp. 183-278.